OMG! Emma I am in love with your sweet little angel card! The embossing looks fantastic! I love Baby Steps! And I cannot wait to order some more stamps! Most of all, I loooove how you teach us something in your videos. Great card! Another fabulous card it is super Duper cute. This card is sooooooooooo adorable!!!! 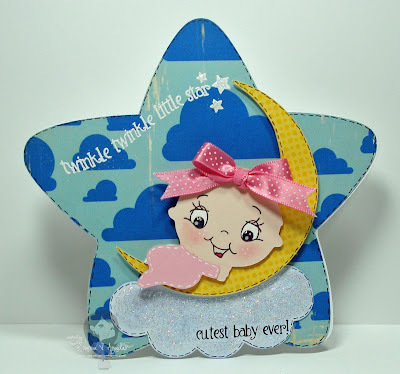 Aww Such a cute baby:)Thanks for the tips with the imagine I was wondering how to cut out a small piece of paper never thought to use the square:)Love the embossing with your stamps! What a sweet card, Emma! Absolutely adorable! I just love that curvy sentiment! OMGsh.. that is too cute!!! I just love the lil baby and the cloud.. sooo sparkly!! I love the face you put on the baby.. sooo cute!!! I HAVE to get that stamp set!!! Thanks for such wonderful inspiration!! This is adorable and unique! Thanks for sharing with us! What a beautiful card! I really enjoy your videos. This is such an adorable card! I think I have used the cloud paper from Hopscotch and Best Friends more than anything else with my Imagine. ;) Can't wait to see your PKS sneak peeks later! Dare I say "the cutest card ever"!! Oh my goodness, Emma, really... I LOVE THIS CARD!! I have those PKS face stamps and LOVE them! I can't wait to see the new stamps coming out, I know I will HAVE to have them! I love this card it is soo adorable!!! Emma your card is soooooo cute!!! Love your stamps and the Peachy Keen face! And I really need to get Baby Steps! Thanks for the great video! You're awesome! So, so sweet, Emma and as always, your details are perfect!! I really love this cute baby girl card! I wish i had an imagine. Super cute card. Love the star. This card is the cutest!!! i love it!! Such a adorable card,Emma! I love the sentiment!! Looks great!! OMG!!!!! Emma I love love this little card it is so cute I just may have to do this one at least try to make this one like your. This is so adorable! I love it! Thanks for mentioning my first video! That was so sweet of you! Emma, that was so cute!